Ever since Clark W. Griswold “took the tribe cross-country to Wally World,” we’ve all been making our attempts to plan the best vacation ever only to encounter some unexpected challenges. 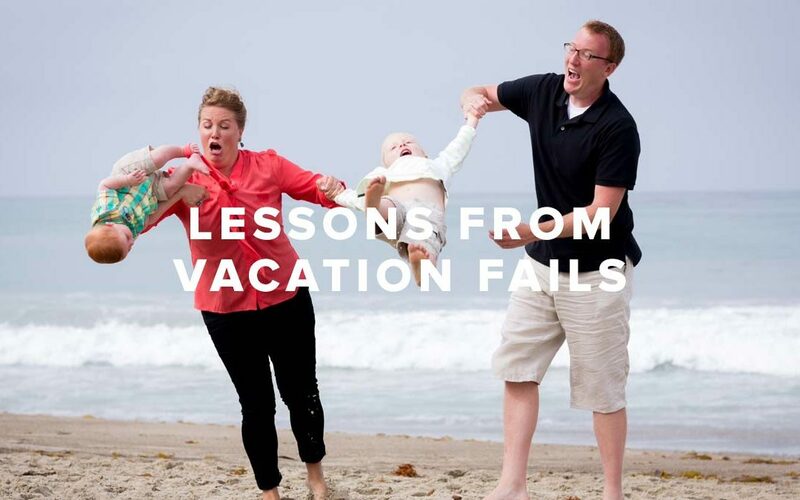 We all start off with good intentions: peaceful bliss, family time, no technology, but sometimes vacations turn as sour as lemons. So, here are a few cups of lemonade we’ve made from our family lemons. One year we decided to drive across country and stay in Missouri with the grandparents. I had the genius idea to take our dogs with us. This worked fine until they got carsick and began to barf all over the luggage. I found myself stopping to buy Dramamine for the dogs. Oh, and by the way, only a few hotels take pets, and, to top it off, they also wake up and bark at any noise outside. It was a less than a pleasant trip filled with a chorus of, “I told you so,” from the passenger seat. Here’s the good that came out of that: One of our dogs climbed up on Grandma’s counter and ate a dish of lasagna prepared for that evening. He survived. But, we still laugh about that! We went to Seattle one year to see the sights, visit some family and for me to speak at a church we helped start. We had reserved a room at a reputable place–Hilton Garden Suites. The kids were thrilled because it had an indoor pool. So when we got to the room, I plugged in my iPad to charge, we put our suits on and headed to the pool. When we came back an hour later, the iPad was gone but whoever came in left behind the master key card to get into the room. I was a bit shocked by this; the kids were more upset that the device to watch movies on was gone. I reported it to the front desk. They gave us a new room, but we spent the rest of the trip barricading the door for fear they were coming back. Here’s the good that came out of that: The hotel comped the room and bought me a new iPad. My wife has talked me into going camping several times. “Oh, but the kids will love it!” is usually the phrase that gets me. The last time we did this involved renting an RV. Knowing I’d never go for tent camping, she had reserved an RV. When we went to pick it up, we discovered this RV was not at the rental center 20 miles away, but rather 60 miles away–we nearly had to camp on our way to pick it up. Driving that beast home I was met with the sweet smell of the toilet that was less than clean. By the time we got to the campground, our friends were waiting and the kids were loving it. The night went great and just about the time the next day that I was settling down and thinking “this wasn’t too bad”, it began to snow. At least it looked like snow–it was ash. Apparently, the hillside nearby was on fire and we were evacuated. Here’s the good that came out of that: We stopped at Chili’s and had a great meal with friends and then we got to go home. The point is this–it’s up to us what good we can make out of difficult circumstances. As the Apostle Paul said, “Rejoice in the Lord … always. I’ll say it again … REJOICE!” Phil.4:4. So, even if this summer doesn’t end up problem free, it still has potential to be the best summer yet. Sometimes the bad moments from Road Trips tend to be the ones we remember, cherish and laugh about. I have a few of those stories from my youth. Sadly my parents are gone now but the cherished memories remain.